Anyone who lives or travels in the west knows well the distinctiveness of this region: it’s not just the mountains, valleys, and deserts, or the mighty Pacific Ocean, it’s the big sky, the quality of the light, the dryness of the air, and the sense, always, that anything is possible, both good and bad. And once you get away from the Pacific coast, there is an independent, rough-hewn spirit that is particularly American. Writers have been exploring the people of the West for a very long time, but it seems as if there is more good fiction capturing this powerful sense of place than ever. In recent years, Peter Heller (The Dog Stars) Kim Zupan (The Ploughmen), Smith Henderson (Fourth of July Creek), Brady Udall (The Lonely Polygamist), and Kent Haruf (Plainsong, Our Souls at Night) have written novels featuring strongly masculine characters and prose and set in Colorado, Utah, and Montana. Women writers have been their equal in this genre, with the bonus that they have subverted some readers’ expectations by featuring female protagonists. The prose and descriptions are as spare as the laconic characters in their books, but they are digging deeper beneath this crusty surface than the genre’s characteristics call for. Noteworthy contributions include Carrie La Seur’s The Home Place (Montana), Nina McConigley’s Cowboys and East Indians (Wyoming), Rene Denfeld’s The Enchanted (Oregon), and Amanda Coplin’s The Orchardist (Washington). S.M. 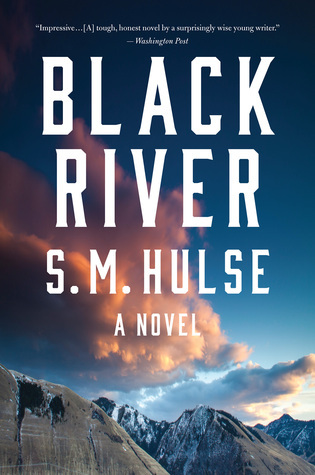 Hulse’s debut, Black River, sits astride these two stellar groups of novels. This slim but potent novel tells of the crisis faced by the protagonist, Wes Carver, when he is forced to return to the tiny town of Black River, Montana following the death of his beloved wife Claire, who expressed a wish to have her ashes spread there. Carver grew up in Black River and followed the men of his family into a career as a correctional officer. But he and Claire left 18 years earlier after a prison riot in which he was held captive for two days by Bobby Williams, a sadist who tortured Carver and left him with crippled hands, forcing Carver to retire and give up his passion for playing the fiddle. Carver is reluctant to return because two people await him, neither of whom he has wanted to face for many years. He has received a letter notifying him of a parole hearing for Williams, who claims to have found Christ. Carver is determined to prevent Williams from seeing daylight. But the more complex situation involves his relationship with Claire’s son, Dennis, whom they left behind as an especially rebellious and independent 16-year-old. He and Carver have hardly spoken since then. But Claire’s death has forced them to face each other. Black River probes deep into Carver’s broken heart and hands as he struggles to achieve some type of understanding with Dennis and a path to peace of mind regarding the Williams incident that has haunted him for so long. Carver is not a religious man, so he is not inspired to find forgiveness in his heart or to believe in Williams’ rehabilitation through faith. But he slowly befriends a skittish colt of a teenager with a troubled family life (his father is an inmate at the prison) who works for Dennis on his farm and shares Carver’s gift for music. Hulse weaves together the various conflicts convincingly. And although we spend a lot of time in the head of the introverted Carver, the plot moves along as steadily as the river at the heart of the novel. Hulse’s writing is spell-binding; it is spare but poetic, and her western Montana setting is a character that looms over the story’s events. Readers will find Carver’s search for redemption a compelling and illuminating journey.